Two multi-billion dollar deals in the news this weekend provide additional evidence of how advances in drilling technology have unlocked vast new energy resources and are reshaping the energy industry. Norwegian oil company Statoil is paying about $4.4 billion for Brigham Exploration, getting “a stronger foothold in unconventional resources” according to the Wall Street Journal. The Brigham deal will gain Statoil a significant footprint in the Williston Basin, a so-called “tight oil” formation that includes the wildly productive Bakken Formation in North Dakota and Montana. Statoil had previously invested in the Eagle Ford Shale in Texas, another unconventional oil and gas resource that has been a source of new reserves. 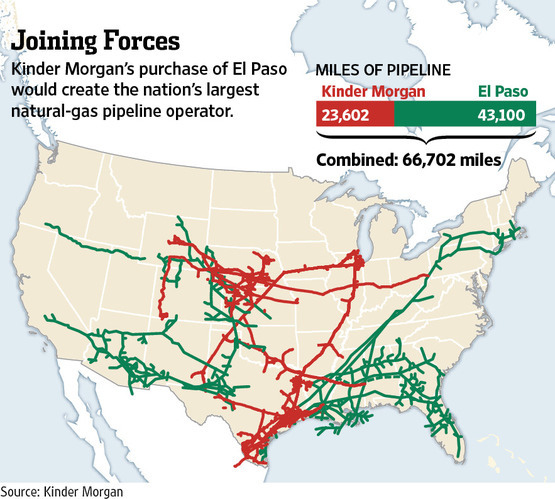 WSJ graphic shows the pipeline footprints of Kinder Morgan and El Paso Corp.
Kinder Morgan on Sunday made a huge bet in the future of natural gas, with word it will buy El Paso Corp. for $21.1 billion in a deal that will make it the largest operator of natural gas pipelines in the country, as well as the fourth-largest energy company in North America. The cash-and-stock deal combines two of Houston’s biggest companies into a single industry titan, with … access to virtually every natural gas field and consuming market in the country. It comes as pipeline companies are repositioning themselves amid a recent surge in U.S. natural gas and crude oil production from shales and other so-called unconventional formations from Texas to North Dakota, and it finds another major energy company signaling its belief that the trend is more than hype. At $21.1 billion, that’s a mighty expensive signal. Admittedly, there is a lot of hype. Some people believe the large resource and reserve additions are almost all hype. Others – and I put myself in this category – believe there is a lot of new very real access to and production from reserves that could not have been legitimately booked as resources five or ten years ago. The trend is more than hype. Can you export some of that US enthusiasm over to here in Europe and get our half-wits who are in charge to ‘step up to the plate’ ! Jimmy, Poland seems to be leading in Europe, maybe other countries with resources will be inspired.